In the Summer of 2011, I wrote at Kirkus about TOON Books. Today’s post is about a new TOON title, R. Kikuo Johnson’s The Shark King, so if you’re thinking, TOON hubba WHAT? and what is Jules going on about NOW?, then you can head on over to that Kirkus column to get the low-down on this imprint. Author/illustrator Amy Schwartz visited 7-Imp for a breakfast chat in June 2010. 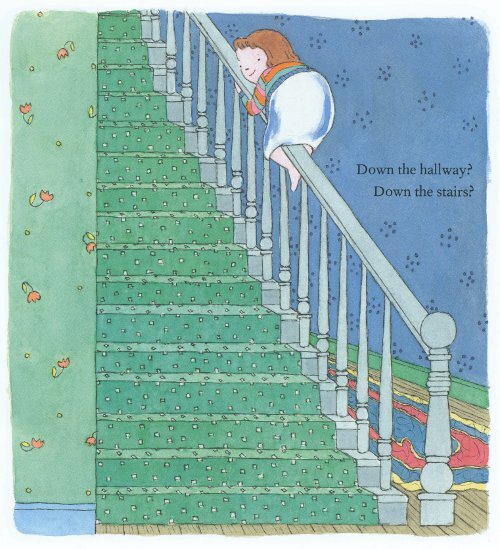 It was there that I reiterated what I love most about her picture books: her attention to detail. The types of details, that is, upon which young children tend to focus. So, it’s with eagerness that I turn toward any of her new picture book releases. And if you’re a fan of her books, it’s a good year to be one. (For all I know, she has even more 2012 releases; I failed to ask her this.) In February, Holiday House released Willie and Uncle Bill, and in August Neal Porter/Roaring Brook will release Lucy Can’t Sleep. I’ve seen a copy of both, including an F&G of the latter, and both are a delight. 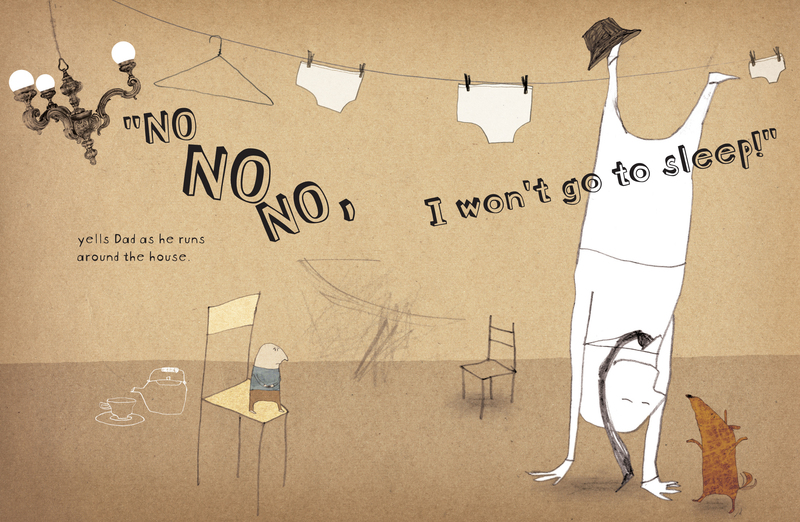 And today at 7-Imp Amy’s sharing a couple of early sketches from one of the books. You’ll often read reviewers use the word “understated” for the humor in Amy’s books. It’s true. 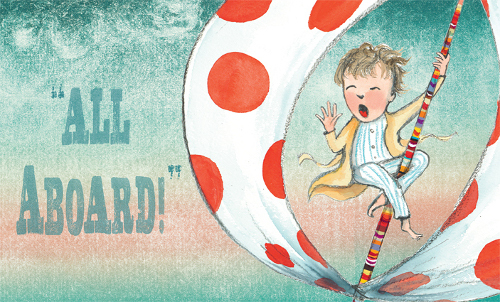 “Droll,” too — and, as I’ve said previously here at Camp 7-Imp, I love a Good Droll. You could easily use both descriptors for Willie and Uncle Bill, a series of three stories about a young boy, mostly silent, and his very outgoing, flamboyant uncle, mostly not-silent and full of good cheer and style. How do you like my new friend here? 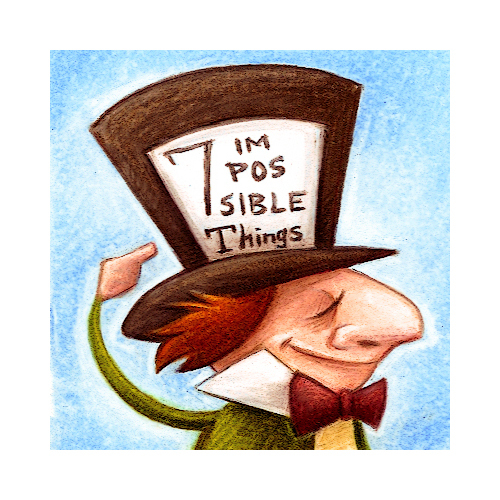 That was created by author/illustrator Aaron Zenz, and he appears in this post Aaron wrote on Monday about some of his favorite blogs. I can’t possibly thank Aaron enough for the kind words about 7-Imp. Oh my. Best part is the company I’m in. Thanks again to Mr. Zenz! 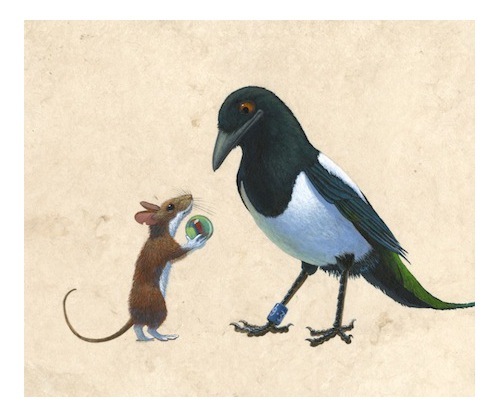 I always look forward to new picture books from Polly Dunbar (who visited 7-Imp back in ’08). 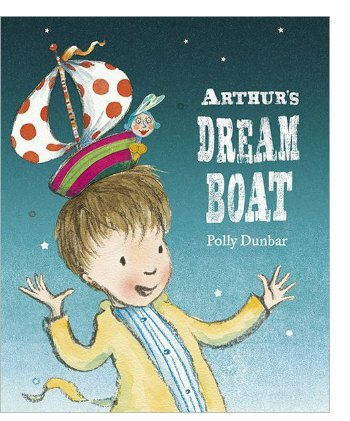 Kirkus calls her newest, Arthur’s Dream Boat, released by Candlewick in February, a “real attention-getter.” In this book, Dunbar asks child readers to consider what is real and what is but a dream. Winking at Shaina, Grandpa took Mama’s hand. ‘What’s it going to hurt?’ he asked. This morning over at Kirkus, I suggest some good picture books for Earth Day — new titles, that is. 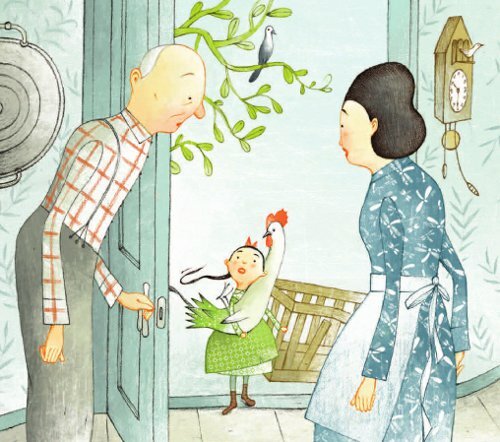 Here at 7-Imp today, I’m showing you some illustrations from one of the books I had intended to include in that column, the very beautiful Isabella’s Garden (Candlewick, March 2012), written by Glenda Millard and illustrated by Rebecca Cool, both from Australia. You may be wondering why I didn’t include that book in the column, if I had intended to do so. What can I say? My brain took a wee nap. I like Isabella’s Garden so much that it was going to lead off my column, in fact. For real. But then, since I have an excess of picture books in my home, I was all, oh! But look over here at this one! Ooh, look at THAT one! Hold up, here’s another …. And pretty soon I was just spinning in circles and had forgotten about my beloved Isabella’s Garden, which all resulted in my hand meeting my forehead. But I share it with you today — just over here at 7-Imp, instead of at Kirkus. Below is a bit more about the book, as well as one more beautiful spread from it. The Earth Day Kirkus column is here this morning. 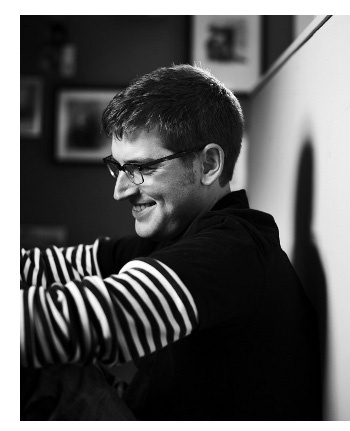 This morning over at Kirkus, I’ve got a short Q & A up with author, historian, and critic Leonard S. Marcus. We’re discussing his (wonderful) new Candlewick title, Show Me a Story! 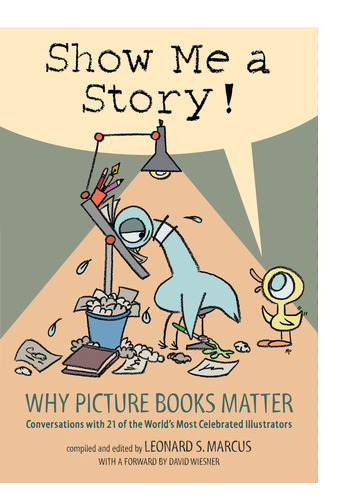 Why Picture Books Matter: Conversations with 21 of the World’s Most Celebrated Illustrators. This will be released in early May. And picture book fans won’t want to miss it. Not if you can help it at all. So. Right. That’s all to say that I am a huge fan of his books and writings in general — and everything he has contributed to children’s literature. The link is here this morning. Come join the fun. I ask him about surprises, contemporary picture books, e-books, whether or not he thinks Don Draper is really ready to settle down, and what he’s researching now. I may not have asked him about one of those. You’ll have to read the Q & A to find out. I’m doing something a bit different for 7-Imp today. 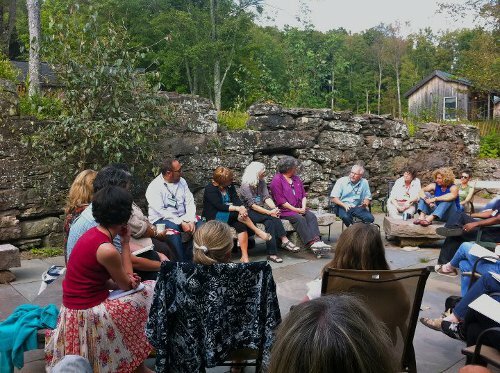 This March, I had the pleasure of being a faculty member (well, sorta — I was a Special Guest instructor) at a Highlights Foundation writers’ workshop up in Honesdale, Pennsylvania. The Foundation is changing the way they’re doing things, given the construction of a new facility at their Honesdale site, and wanted folks to help get the word out, and I said I’d be happy to contribute with a short Q & A with Kent Brown, Executive Director of the Highlights Foundation. Sheer and utter laziness is what I bring you today, dear Imps. Well, laziness of a sort. I have some illustrations to showcase today, but as for my thoughts on the book, I’m going to direct you to Betsy Bird’s recent review of the same title. And that’s for several reasons: 1) I’m sleepy right now but really want to yawp about what a good book this is; 2) what a good book this is! ; and 3) Betsy … well, shoot, y’all. She is such a detailed and thoughtful reviewer. (And her INTROS! The intros to her reviews, I always note, are so well-penned. That’s an art and a science right there, nailing an intro and snagging the reader. But I digress.) Once I read her review, I thought, hmmm…what she said. 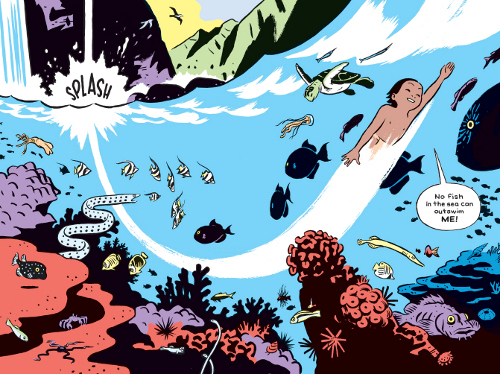 So, I’m going to just shoo you on over to her review — after you take in these spreads, that is. The book in question? 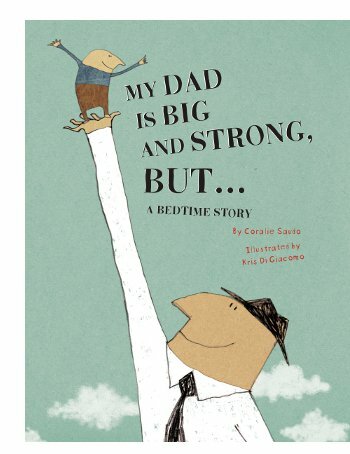 Coralie Saudo’s (also an illustrator) My Dad is Big and Strong, But… This is a French import, originally published in 2010 as Mon Papa, Il est Grand, Il est Fort, MAIS… As I’ve said before, thank goodness for Enchanted Lion Books and their eye on international titles. Translated by Claudia Zoe Bedrick and illustrated by Kris Di Giacomo, this one is a true delight.